A wonderful plant for the rock garden, Gentiana acaulis with its brilliant blue flowers in late winter to spring is originally from the European Alps. Growing equally well in a container the large tubular blue flowers with green hints in the throat make it one of the best true blue flowering plants of all. A few web sites suggest that this is a summer to spring flowering plant, however the picture right, was taken in mid winter in the Dandenong Ranges outside of Melbourne. So flowering will depend a little on climate, from spring through to autumn, and in winter in some climates. Also known as the stemless blue gentian, flower color will differ from paler blues through to deep blues. Over time the plant will spread to form a dense mound of foliage, once they decide to flower one will appear after another, masses of single blue flowers that are really an electric blue. A well drained humus rich soil is essential, full sun to afternoon shade depending on the climate, however in deep shade the flowers will sulk and refuse to open. We have found that a good amount of perlite dug into the soil or mixed into the potting mix helps with drainage. Although plants are said to be acid loving, for us a good handful of lime has helped ours to flower. As well as regular liquid fertilizer during the growing season. Propagation is by division of established clumps, best in late winter to spring. However, be warned that Gentiana acaulis is likely to refuse to flower the year after division, in fact it resents being transplanted or disturbed. we grow them in the rock garden as well as in containers. 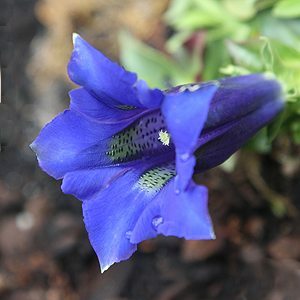 We have seen seeds available for sale online, however you will need to be a very patient gardener to grow Gentiana acaulis from seed. 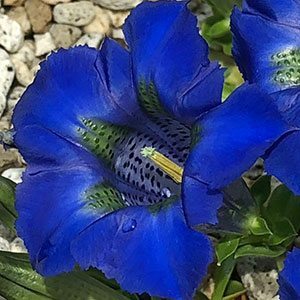 The paler blue Gentiana acualis ‘undulatifolia’ and ‘sternschuppe’ are generally not available for sale in Australia, if you find them let us know. Flower – Brilliant blue with green markings in the throat.